'The small golden mosque at Gour'. Aquatint, drawn and engraved by James Moffat after Henry Creighton. Published Calcutta. Undated. bl.uk > Online Gallery Home	> Online exhibitions	> Asia, Pacific and Africa Collections	> 'The small golden mosque at Gour'. Aquatint, drawn and engraved by James Moffat after Henry Creighton. Published Calcutta. Undated. 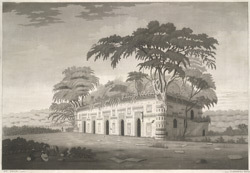 Aquatint with etching by James Moffat after Henry Creighton, of the small Golden Mosque at Gaur, published in Calcutta. The ruined city of Gaur is located on the India-Bangladesh border in the Malda district of West Bengal. Bengal was conquered by the Delhi Sultanate in the early 13th century. Gaur later became the capital of the Sultans of Bengal and a centre of provincial Islamic culture until its abandonment in the late 16th century. The Chota Sona or Small Golden Mosque, as it is known by the local people because of the now-lost gilded decoration of its domes, was built by a noble at the court of Sultan Husain Shah (ruled 1494-1518). The mosque displays typical regional features in the Bengal style. It has an oblong shape with octagonal towers at the corners. The richly decorated stone facade has five openings with pointed arches profusely decorated with floral and epigraphic motifs. The sides have three entrances similarly decorated. The roof is covered with twelve small hemispheric domes and three 'char chala' Bengali roof forms with crossed rounded ridges and curved eaves.